Preheat oven to 240°C (475°F). Place the sweet potato, oil, chilli, salt and pepper on a large oven tray lined with non-stick baking paper. Cook for 10 minutes. Add the almond and haloumi to the tray and cook for a further 10 minutes or until golden brown. While the sweet potato is cooking, cook the pasta in a large saucepan of salted boiling water for 6 minutes or until al dente. Drain, reserving ½ cup (125ml) of the cooking liquid. Return the pasta, cooking liquid, mascarpone and lemon rind to the pan and mix to combine. 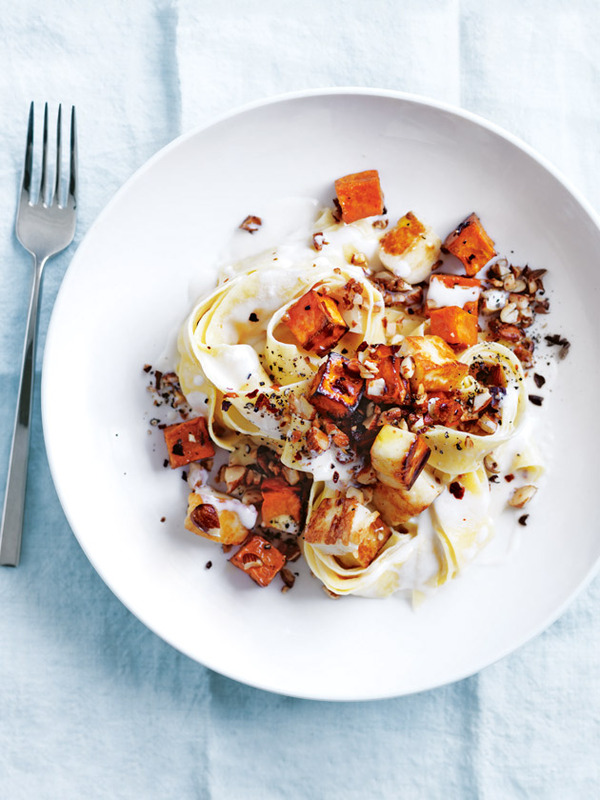 Serve the pasta topped with the sweet potato mixture and sprinkle with pepper to serve. Serves 4. This has become a weekly dinner! I also use pumpkin instead of sweet potato. Thanks for the delicious recipe.